"Chinese students with Fr. 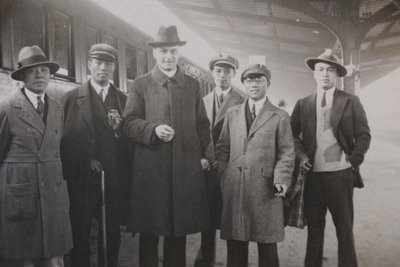 Paul Gilson in Brussels"
Group of Chinese students with Fr. Paul Gilson at the Gare du Midi (Brussels South Station) on the day of his departure for China. Zhang Chongren in front row to Gilson’ left. Chinese students with Fr. Paul Gilson in Brussels. September 13, 1931. Société des Auxiliaires des Missions (SAM) China Photograph Collection, Whitworth University Library, Spokane.